This is a very long post. Every detail I could think of is covered in excruciating detail for those who might otherwise be alarmed by the prospect of knitting a seamless tube. However, this is actually a very simple "envelope-style" ski hat, knit from the top down with a too-long circular needle in the "Magic loop" technique. A too-long circular needle in any size you want to try, in a length of 40 or 47 inches. The needle must have a VERY flexible cable. A second too-long circular needle OR a 16" circular needle, 2-3 sizes smaller than the first, to be used for the ribbing. Addi Turbos are usually too shiny for me, but they unquestionably have a very pleasant, flexible cable, well-attached, which easily stands up to the cable-torture the Magic loop technique metes out. I think of ski hats as being knit tighter than ordinary hats, and the two sample hats of the illustrations were each knit tighter (that is: with smaller needles) than is usual for that type of yarn. You can make up your own mind about this. Because it is gaugeless, you can mess around on this hat matching needles to yarn, to see what happens to stitch gauge and row gauge. If you need more info than the pattern contains, some of the methods used in this hat have been described elsewhere in this blog. Most of these links are also inserted in the part of the pattern where you'd maybe need them, but they're also collected here in one handy spot. STEPS 1-4 are only done once for each hat--to get the hat started from the TKIO. step 1: (below) Make a TKIO as set forth in the TKIO post. However, do not transfer the stitches to double pointed needles. step 2: (above) Transfer the TKIO to circular needles as shown. The ball yarn is coming out to the left, the needle tips are facing left, and you are looking at the "outside" of the TKIO. TECHtip: All kinds of side-to-side AND top-to-bottom rotation is going to happen next. To better track which needle is which, maybe get a SHARPIE and mark your top needle--the one that's red in the illustrations. Having a mark makes it much easier to follow the action--the marked needle will always be your working (right) needle. step 3: (below) To get this configuration, the TKIO has been flipped side-over-side so the ball end now comes out to the right, the needles point right, and you are looking at the "inside" of the TKIO. step 4: (above) The red needle has been drawn all the way through the top three stitches. Those stitches are now resting on the cable, and the red needle has been brought all the way around to the working position. Fold the TKIO in half so the inside is in and the outside is out--the TKIO should hang DOWN from your needles, not stick up (see step 5 for a picture of this). Using the red (working) needle, knit the three stitches on the green needle. This knits one side of the TKIO shut. (For further info on splitting the stitches into sets, try this link.) You are now about to start knitting on the hat, proper. TECHtip: Give the yarn a good yank before you knit the first stitch of any set. See--on a circular needle, the cable is a much smaller diameter than the needle tip. 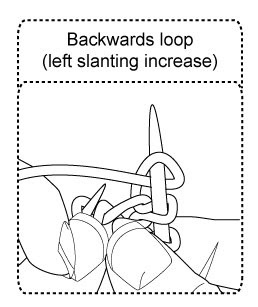 By giving the yarn a good yank before you start knitting with the red (working) needle, you're removing the normal slack between the stitches AND considerably tightening up the loop of the previous stitch, that being the last stitch on the cable. By making the last few stitches on the back needle smaller, and removing the normal slack between the stitches of the back set and the first stitch of the front set, you will get a nice, crisp edge--a built-in fold line. In fact, because of this tightening trick you'll get a MUCH nicer, crisper edge between the stitch sets with Magic loop than would be possible with double pointed needles (dpn's have no small diameter cable to tighten edge stitches around). In a previous post, I said that I find Magic loop best suited to items which will be used folded over as they are knit, such as the ski hat we're making here. This fold-line trick is the reason. BTW: the opposite is true also. If you want to knit truly round objects--such as socks--with the Magic loop technique, you have to be careful NOT to give that edge stitch a yank, or you will get a "fold line" down the middle of your sock, where you might not want one! Steps 5-8, when repeated ONCE make a half round. Each full round is made of two half rounds. This hat is knitted by alternating one full round "plain" and one full round with increases. On every plain round, no increases occur--you simply knit into every stitch on your needles, including knitting into the increase stitches which were added in the row below. On every increase round, you add four stitches. By locating these four stitches near each end of each stitch set, you get the classic "envelope" ski hat shape. In starting the hat from the TKIO, you have actually already knit 1/2 a round plain--all that remains in the first round of plain knitting is to create another 1/2 round. step 5: (below) The front three stitches have been knit with the red (working) needle, and the green needle is popped loose of the work. step 6: (above)To get to this configuration from step 5, draw the green needle (the needle now loose) rightwards, so the back stitches which were on the cable, will be resting on the green needle instead, as illustrated. step 7: (below) To get to this configuration from step 6, the work has been flipped side over side, such that the red (working) needle (carrying the stitches just knitted) is in the back, and the green needle is in the front. step 8: (above) To get to this configuration from step 7, the red (working) needle has been drawn out of the back stitches such that these back stitches rest on the cable of the circular needle. The red (working) needle has been drawn to the front, and is ready to knit the front stitches off the green needle. 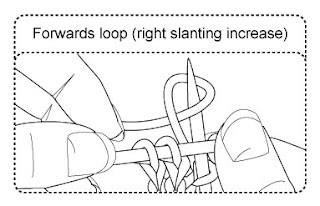 To complete the second half of the round, use the red (working) needle to knit the front 3 stitches off the green needle, until you are back in the same configuration as shown in step 5. Steps 5-8 are the steps you will follow to make every 1/2 of every plain (no increase) round. In other words, to make a whole plain round, you would repeat steps 5-8 twice--once on the front set of stitches, and once on the back set of stitches. •Knit to within 1 stitch of the end of the stitch set (on the first time you do this, you'll only have to knit 1 stitch before you are within 1 stitch of the end of the stitch set). •Make a left leaning increase by the backwards loop method. From here on out, you follow the Magic loop sequence of steps 5-8 for each half round. The hat is created in 2-round cycles: On alternate full rounds, you knit plain on both sets of stitches (no increases) and on the following full round you create increases during step 8 on both halves of the round (both sets of stitches). 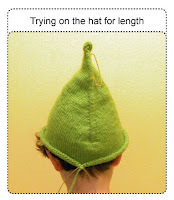 In knitting the hat from the top down, you quickly create enough fabric to measure. And measure it you should. Begin by steam blocking--once you've made enough fabric so you can keep your iron away from the needles (and especially, away from the plastic cable) lay the work (still on the needles) on the ironing board. Set the iron on steam, hold the iron an inch or so above the fabric, and let the steam penetrate the fabric. Pat the fabric flat, let it dry (takes only a very few minutes). Lay a tape measure on the hat. Now you've got your stitch gauge--the number of stitches to each inch of fabric. You might think the next step would be to measure your Intended Wearer's (IW's) head and keep increasing to match that measurement, but there is a better way. You see---measuring your IW's head does not tell you anything about how your IW likes hats to fit--whether tight or loose. In other words, a head measurement tells you your IW's head size, but says nothing about how much "ease" they prefer in a hat. Instead, take your Intended Wearer's favorite hat, and measure how big around THAT is. Do the math and figure out how many final stitches you must have to make the hat you're knitting match the favorite hat. As an example, if the IW's favorite hat is 21 inches around, and if you are getting 5 stitches per inch, your final stitch count ought to be 21 x 5, or 105 stitches. TECHtip: Gauge is notoriously hard to nail down, partly because it's so hard to measure. It's very common to mistake 5-1/4 stitches per inch for 5 stitches per inch, or 4-3/4 stitches per inch for 5 st/in. Result? Garments too big or too small. Stack the odds in your favor: measure over 3 or 4 inches or even more. Measuring over this longer span makes it less likely that you're holding the material under tension when you measure, and it also makes it easier to account for fractional stitches. It is because bigger gauge swatches are much better than smaller ones, that gaugeless hats are such a great way to test-drive your yarn while also creating a reliable gauge swatch. You might think it wise to test the hat's diameter by having the IW try on the hat-in progress. 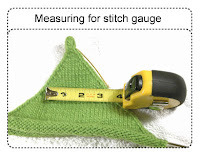 But beware: a try-on can be misleading because stitch gauge has the most ferocious tendency to stretch on a piece of knitting which is not bound off. If the trial try-on and the mathematical option disagree, let the math rule. As long as you've carefully measured your gauge AND the target hat, then--as counter-intuitive as it may seem--the math is far more likely to be right than the try-on as regards the diameter of the hat. Once you've got the hat as big around as you need it, stop increasing and simply knit the rest of the hat plain until it is as long as you need the hat to be. Unlike the diameter of the hat, however, the length is a little trickier to measure off an already existing hat. As you can see from the picture, these two hats, knit to the same pattern but out of different yarns have vastly different relative row gauges--they have different angles and rates of increase. The first time through with a new yarn, you really don't know if the ski hat you're knitting might wind up with a relatively flat-ish top, or almost pointy enough to be an elf-hat. 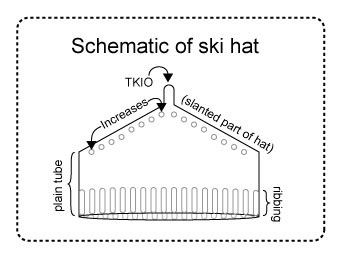 This means that even if the ski hat is pretty much the same style as the IW's favorite hat, unless both hats have the same relative row gauge (angle of slope), you really can't measure the correct length from an existing hat because you can't know how deeply into the point your IW's head will go. This is where it IS handy to have the IW try on the hat-in-progress: unlike stitch gauge --which stretches madly on unbound knitting--the row gauge on the hat-in-progress won't stretch. Therefore, you may confidently rely on the try-on to determine the length. As you knit the plain tube, there is no reason to keep the two circular needle cable loops popped loose of the fabric between the stitch sets as you've been doing up to now. In fact, there are good reasons why you shouldn't keep the cable loops popped out in the same place. If you keep the stitch sets separated past the increase rounds, you may wind up with the fold line carrying down the body of the hat, where no fold line is necessary. To avoid this problem, you can either switch to a shorter (16") circular needle in the same size as the one you have been using, OR you can switch to a more free-form version of Magic loop knitting which has only one loop of cable popped free. To do this, you simply dig out one loop of cable from between two random stitches, about 3/4 of the round away from where your needle tips are. When you've knit to that spot, you reposition the cable another 3/4 of a round away from where the needle tips are, and so on . By randomly varying the place where the cable pops loose of the fabric, you avoid the fold line problem, and you also avoid any tendency towards ladders which might otherwise trouble you. In any event, however you choose to do it, at some point, you will have knit the plain tube of the hat 1-2 inches less than the final desired length. The last 1-2 inches of the hat are knit in ribbing. If you have a sort of ribbing you prefer, and if you have neat way to bind it off, use that. Otherwise, switch to a 1/1 ribbing (k1, p1) and prepare for the ribbing transition zone as follows: Switch to needles 2-3 sizes smaller, and knit the last full round of the hat. On the next round, establish the 1/1 ribbing by slipping the knit stitches, and purling the purl stitches. On every round after that, create the ribbing by knitting or purling as the pattern is set. When the ribbing is long enough, bind off. 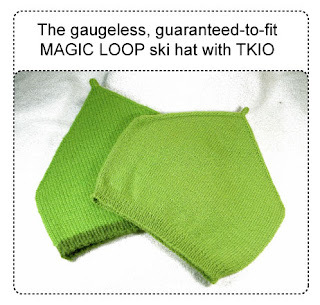 That's it--you have a gaugeless, guaranteed-to-fit, Magic loop ski hat, started with a TKIO. 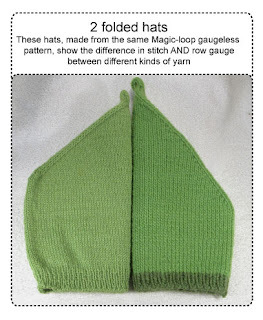 (You have been reading TECHknitting on "TECHpattern and tutorial: gaugeless MAGIC LOOP ski hat with a TKIO (Part 3 of the "knitting seamless tubes and circles" series)"